If you’re flying from Pune to Bangalore, the chances are very high that you are travelling for work purpose. So, whether you’re travelling for leisure or business, having a smooth flight booking experience is what we want you to experience. From flights without layovers and flights that arrive early in the morning to which airline operates at what time and how many flights depart in a day, we have it all! We provide you with all the information required to book Pune to Bangalore flight. To book cheap Pune to Bangalore flights it is recommended to book it 40 – 60 days prior to get your hands on amazing deals. Pune is the second largest city in Maharashtra and also one of the fastest developing information and technology hubs in the country. Pune is home to several historical monuments and temples. Despite being a major city, Pune has managed to retain its unique traditional charm thus offering the best of both worlds for the travellers. Pune offers plenty of activities like bird watching, paragliding, trekking, and heritage walks. The top sightseeing spots in Pune are Mahatma Phule Museum, Aga Khan Palace, Raja Dinkar Kelkar Museum, Tribal Museum, Bund Garden, Katraj Zoo and many more. All flights to and from Pune operate from the military airport located at Lohegaon. The airport serves all popular domestic carriers like SpiceJet, IndiGo, AirAsia, TruJet, Jet Airways and Vistara. Apart from domestic flights, the airport also serves direct international flights to Frankfurt and Dubai. 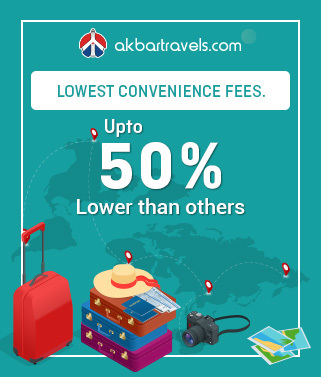 Find the best deals on Pune flight tickets on www.akbartravels.com and book your flights at the lowest airfare along with benefits like instant confirmation, airfare calendar, lowest convenience fee and easy cancellation/refund. Lohegaon Airport (PNQ), Lohegaon, Pune, Maharashtra 411 032. Bangalore is well-connected by regular flights from Delhi, Mumbai and other important cities in India. It also has international carriers flowing in and out of the Bengaluru International Airport, which is positioned about 40 kilometers from the main city. A taxi or a bus from the airport would take about 45 minutes to reach the city. Bangalore is well-connected by a network of buses like Goa, Coimbatore, Mumbai, Pune, and Mangalore. The options range from regular buses to air-conditioned, and sleeper coaches. While some are run by Karnataka State Road Transport Corporation, and some by the private bus operators who run inter-city buses to and from Bangalore. There are two important railway stations in Bangalore i.e. Bengaluru City Railway Station and Yeswantpur Junction. Both have regular trains running from Delhi, Mumbai, Pune, and other major cities. For internal commuting, there is Namma Metro which is an intra-city rail network set up by the Bangalore Metro Rail Corporation. Bangalore is a huge place and is charming and addictive for a good reason. Inviting cafés, brilliant infrastructure, gorgeous gardens and some of the classiest and fabled restaurant scenes makes it just perfect for the fast-paced life that you have always dreamed of living. Take a look at the best things to do in Bangalore that should not be avoided. 1.Which months have the lowest fare for Pune to Bangalore flights? January is the month with the lowest fare for Pune to Bangalore flights. 2.What is the best month to travel to Bangalore by Pune to Bangalore flight? The best month to travel to Bangalore is between the months of October to February. Kempegowda International Airport is about 40km from the city centre. The city centre is connected to the airport via taxis (Prepaid Airport Taxis or Local Public Taxis), airport shuttle and buses. 5.What is the currency of Bangalore and its approximate conversion rate? The currency used in Bangalore is INR which is also followed by Pune. 6. What is the time difference between Pune and Bangalore? There is no time difference between Pune and Bangalore. 1.What are the top airlines that operate from Pune to Bangalore flight route? These are the top airline brands which fly from Pune to Bangalore – IndiGo, Airasia India, SpiceJet, Jet Airways, GoAir, JetLite and Air India. 2.At what time does the first flight leave from Pune to Bangalore? The first flight from Pune to Bangalore is IndiGo at 12:45 AM. 3.When does the last flight leave from Pune to Bangalore? The last flight from Pune to Bangalore is IndiGo at 11:45 PM. 4.What are the airport codes of Pune to Bangalore? Airport code of Pune is PNQ and Bangalore is BLR. 5.What is the name of the airport in Pune? The name of the airport in Pune is Pune Airport. The name of the airport in Bangalore is Kempegowda International Airport. First city to be electrified: In 1906, Bangalore became one of the first cities in India to have electricity from hydro power, powered by the hydroelectric plant situated in Shivanasamudra.